The latest book in the First World War Centenary History programme will be launched on Friday, November 9. 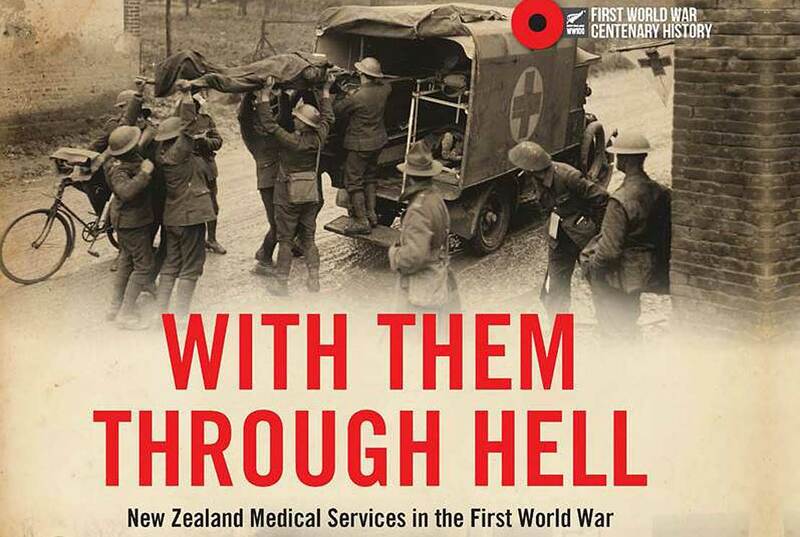 A new book revealing stories of courageous medics who served in the First World War – from stretcher bearers to dentists and veterinarians – will be launched this Friday as part of a special event in Palmerston North to mark the centenary of Armistice. 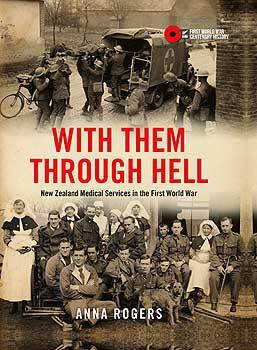 With Them Through Hell: New Zealand Medical Services in the First World War (Massey University Press), written by editor, author and explorer Anna Rogers, is the most recent volume from the First World War Centenary History Programme. On Friday November 9 a spectacular family friendly event marking Armistice Day (November 11) will feature guns from the 16th Field Regiment of the Royal New Zealand Artillery will be held at Palmerston North’s Awapuni Race Course and Function Centre. Live music, including Tchaikovsky's 1812 Overture, will be performed by the New Zealand Army Band and Palmerston North Brass Band along with a Beating Retreat Military Parade. The 7pm book launch will be led by war historian and prolific author Professor Glyn Harper and features a presentation by guest speaker Professor Darryl Tong, University of Otago on Medical Developments During the Great War, as well speeches by Massey University Provost Professor Giselle Byrnes, Research and Enterprise, Nicola Legat, publisher of Massey University Press, and Dame Silvia Cartwright. The book explores the experiences of thousands of New Zealand men who fought in the First World War and those who cared for them. This fighting force was armed with scalpels, bandages and drugs. Hundreds of doctors, nurses, stretcher-bearers, orderlies and ambulance drivers, dentists, chiropodists, pharmacists, physiotherapists and chaplains cared for the sick and wounded, often at great personal risk. Veterinarians did the same for horses, camels and other animals. The challenges were enormous, says the author — horrific injuries, gas and deadly diseases, especially the influenza of 1918. There were some astonishing successes — most famously by plastic surgery pioneers Harold Gillies and Henry Pickerill — but the price was high, for patients and carers. Ms Rogers says she hadn’t thought about the important role of army medics until she began her research. The White Ships: New Zealand’s First World War Hospital Ships, by Gavin McLean (New Zealand Ship & Marine Society, 2013). The story of New Zealand’s two hospital ships during the First World War. New Zealand and the First World War, by Damien Fenton (Penguin Books, 2013). A general history of New Zealand’s role in the First World War, analysing 50 key episodes. As well as providing a brief overview of each campaign and battle fought, the book featured fold-out maps, posters, letters, postcards, documents, and more than 500 images. Johnny Enzed. The New Zealand soldier in the First World War, by Glyn Harper (Exisle Publishing, 2015). The complete story of the New Zealand soldier in the First World War, using the letters and diaries of more than 2000 soldiers. New Zealand’s First World War Heritage, by Imelda Bargas and Tim Shoebridge (Exisle Publishing, 2015). This book examines how the First World War had affected the New Zealand landscape. It looked at such diverse aspects as military training camps, war memorials, museums, convalescent homes, soldiers’ clubs, soldier-settler farms and wartime businesses. Experience of a Lifetime: People, Personalities and Leaders in the First World War, edited by John Crawford, David Little wood and James Watson (Massey University Press, 2016). A collection of papers from the successful international conference held as part of the Centenary History Programme in 2014. New Zealand's Western Front Campaign, by Ian McGibbon (Bateman, 2016). With nearly 14,000 dead, the Western Front was the most costly of all the campaigns New Zealand military personnel have took part in, accounting for two thirds of New Zealand's fatalities in the First World War. This book covers this participation in all its facets, challenges myths that exist about New Zealand's effort and throws new light on aspects of the involvement. Fearless: the extraordinary untold story of New Zealand’s Great War airmen, by Adam Claasen (Massey University Press, 2017). Close to 850 men, and a small number of women, from the Empire’s southernmost dominion sought positions in the British and Australian air services. Drawing on extensive archival material this book tells their unique and extraordinary untold story. The book was longlisted for the 2018 Ockham New Zealand Book awards. For more information about the book click here. Read Q&A with author here.